Cavendish’s premier resort located on beautiful six-acre estate beside Green Gables House/Golf Course/Avonlea Village. Cavendish Beach 800 m. Inn and Gatehouse decorated with country elegance. Warm hospitality. Large rooms, suites, private baths, air-conditioned, room phones, wireless internet. King, queen, double, single beds. 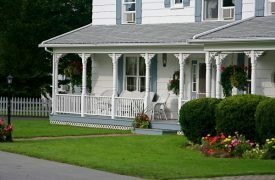 Fireplaces, jacuzzis, cable TV/DVDs, free movies, pool, whirlpool, laundromat, fitness/recreation centre. Free parking. Wheelchair-accessible units. Includes country gourmet breakfast with juice bar. Romance/Anne/Golf packages customized. 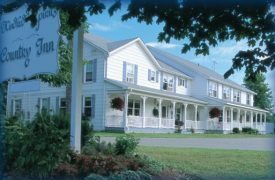 Modern amenities with elegance – a Prince Edward Island experience. No pets, please. AE, MC, V accepted. Breakfast Inn: 25 o/n units. 25B&S (15 jacuzzis). Daily $90-295(1-2), $20 add’l person. Cottage: 20 hsk units. 29B&S(13 jacuzzis). Daily $110-475(1-6), $15 add’l person. Weekly rates available. Prices include off-season rates. B&B Suite: Daily $115-295(1-2), $20 add’l person. Full breakfast included. Weekly rates available. Prices include off-season rates.